AMHERST, N.Y. – Several Daemen College athletic training students recently participated in a community service project to help beautify Amherst State Park on Mill Street. 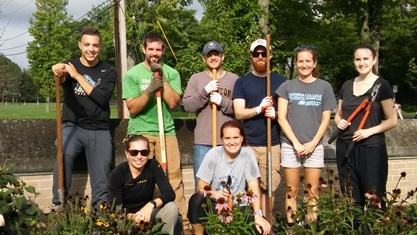 The Daemen group, which also included a 2016 graduate of the athletic training program, assisted with sprucing up the park’s entryway, removed overgrown shrubs, and weeded the area. Their work was overseen by Rebecca Romano Besch, clinical assistant professor of athletic training and health promotion, and done in cooperation with Lois Shriver, chairperson of the Amherst Conservation Advisory Council. "As an essential part of a Daemen education, community service opportunities like this create meaningful experiences for our students and have a positive impact on our communities,” said Dr. Nicole Chimera, athletic training program director and associate professor. Pictured (L-R) are: first row - Rachel Reichart ’16 of Marilla and Stephanie Czaja of North Tonawanda; back row - Jacob Habermehl of Cheektowaga, Phillip MacLeod of East Aurora, Conner Lorenzo of Rochester, Caleb Earl of Kenmore, Professor Rebecca Besch, and Abigail Gullo of Depew.